Throughout the course of the day Sky Sports News have continued their hyperbolic and irritable tendencies. Today it was regarding Lionel Messi, heralding him as not only the world's best footballer, but amongst the best of all time. After his wondrous exploits against Arsenal yesterday, they dared to draw comparisons between him and Diego Maradona. This made me suitably enraged enough to write the words that you are currently reading. Rants against Sky Sports News aside - which are plentiful and must be saved for another time - can we please stop this consensus that Messi deserves to placed alongside the upper echelon of players to have graced the game. First, he is still only 22 and has only been playing regular first-team football for about four years. A career simply cannot be made in that time. Also, I have lost count over the amount of times in recent years, media outlets have proclaimed a player as one of the best ever. You can transpose the current platitudes Messi is receiving to Ronaldinho in 2006, Rivaldo in 2001, or Ronaldo (the Brazilian one) throughout most of the 1990's. While Ronaldo's circumstances are mitigated by the cruel luck he had with injuries in his career, all three are examples of exceptionally talented individuals who were unable to replicate their best for a sustained amount of time. Greatness isn't fleeting, it's indelible. That's what made someone like Maradona one of football's finest exponents. His ability not to do great things. But to do them again and again. Too often these days football fans thing quality is demonstrated by a player's clip montage on YouTube. This is probably symptomatic of the society we live in, "Excite me, excite me now, I don't need the details, just give me the gist". As far as I'm concerned those who seek out nothing more than a highlight reel should stay off my television and keep their mouths shut. Thankfully Messi seems to insulate himself from the hype surrounding him. Only today, when pursued by cameras in a manner more befitting Cheryl Cole, he said he feels that he can still improve. He's right. Messi knows that he was born with the ability to become one of the greatest to light up the game. But that can only be achieved on the World & European stage. As fate would have it, we have a World Cup on its way in two months time. 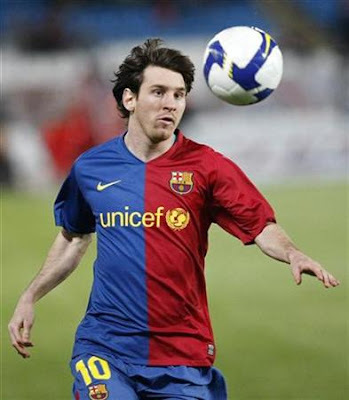 If Messi can shine on football's grandest stage he will be on the path tread only by a select few. But as of now, it's still an if. The only man in recent years who could be described as truly great was the Frenchman, Zinedine Zidane. While he may be best known for the headbutt that ended his career, he won The European Championship, The World Cup and The Champions League, playing a major role in all three triumphs. Add that to his many domestic trophies and being decreed the World's best player three times and you have a truly stellar career. However, all this took a little more than five minutes to achieve, so let's just stand back for a while and give Messi time to prove how good he really is, rather than how good he could be. There's little doubt that Messi wants to be mentioned in the same breath as Pele, Maradona, Cruyff, Di Stefano, Puskas and Zidane. He's only taken the first step on a very long road. The hard work has only just begun.